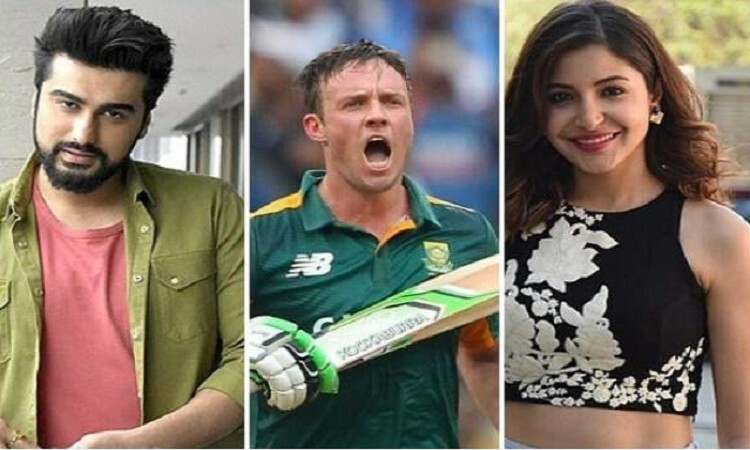 Mumbai, May 24 (CRICKETNMORE) - Bollywood celebrities like Anushka Sharma, Arjun Kapoor and Rahul Bose have wished luck and happiness to South African batsman AB de Villiers, who has announced his retirement from international cricket. AB de Villiers, who featured in 114 Tests, 228 ODIs and 78 T20Is for South Africa, sprang a surprise when he announced on Wednesday he was bidding adieu to all forms of international cricket with immediate effect. Anushka Sharma: In life, what we do to positively impact the lives of others has greater meaning than what we accomplish for ourselves. You have managed to do both beautifully and always with such grace and integrity. Wishing you and Danielle a blessed, happy life ahead AB de Villiers. Arjun Kapoor: Congratulations AB de Villiers, what a spectacularly proud cricketing career you've had! Your game will be talked about for years to come. Wish you all the best for your future endeavours. Aadar Jain: AB de Villiers, you have amazed us all with your spectacular skills on the field! The world of cricket will truly miss your presence sir. Saiyami Kher: Oh no. AB de Villiers please play a little longer. Please. Rahul Bose: Sunil Gavaskar once said, ‘Retire when people ask why, not when they ask why not?' Still, the AB de Villiers retirement is too early. Today sports science does not care about chronological age. It's about your performance age. By those metrics ABD's in his late 20s. And what talent. Sophie Choudry: You are a class act and an absolute legend AB de Villiers. With some of those crazy catches this Indian Premier League, it feels like you just got started! You will be missed but Thank you for entertaining us with your insane talent over the years! Much love and respect to you.